Lipids are a group of naturally occurring molecules that include fats, waxes, sterols, fat-soluble vitamins (such as vitamins A, D, E, and K), monoglycerides, diglycerides, triglycerides, phospholipids, and others. The main biological functions of lipids include storing energy, signaling, and acting as structural components of cell membranes. 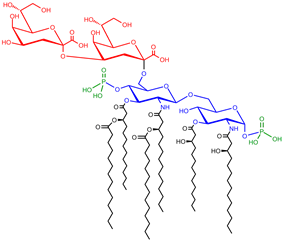 Lipids have applications in the cosmetic and food industries as well as in nanotechnology. Lipids may be broadly defined as hydrophobic or amphiphilic small molecules; the amphiphilic nature of some lipids allows them to form structures such as vesicles, multilamellar/unilamellar liposomes, or membranes in an aqueous environment. Biological lipids originate entirely or in part from two distinct types of biochemical subunits or "building-blocks": ketoacyl and isoprene groups. Using this approach, lipids may be divided into eight categories: fatty acids, glycerolipids, glycerophospholipids, sphingolipids, saccharolipids, and polyketides (derived from condensation of ketoacyl subunits); and sterol lipids and prenol lipids (derived from condensation of isoprene subunits). Although the term lipid is sometimes used as a synonym for fats, fats are a subgroup of lipids called triglycerides. Lipids also encompass molecules such as fatty acids and their derivatives (including tri-, di-, monoglycerides, and phospholipids), as well as other sterol-containing metabolites such as cholesterol. Although humans and other mammals use various biosynthetic pathways to both break down and synthesize lipids, some essential lipids cannot be made this way and must be obtained from the diet. The chemical formation of pre-biological lipids and their formation into protocells are considered key steps in models of abiogenesis, the origin of life. Fatty acids, or fatty acid residues when they form part of a lipid, are a diverse group of molecules synthesized by chain-elongation of an acetyl-CoA primer with malonyl-CoA or methylmalonyl-CoA groups in a process called fatty acid synthesis. They are made of a hydrocarbon chain that terminates with a carboxylic acid group; this arrangement confers the molecule with a polar, hydrophilic end, and a nonpolar, hydrophobic end that is insoluble in water. The fatty acid structure is one of the most fundamental categories of biological lipids, and is commonly used as a building-block of more structurally complex lipids. 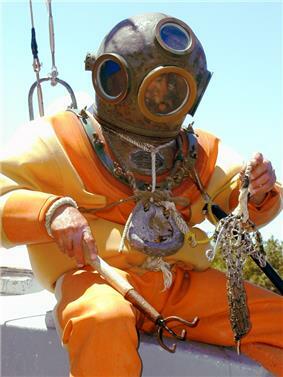 The carbon chain, typically between four and 24 carbons long, may be saturated or unsaturated, and may be attached to functional groups containing oxygen, halogens, nitrogen, and sulfur. If a fatty acid contains a double bond, there is the possibility of either a cis or trans geometric isomerism, which significantly affects the molecule's configuration. Cis-double bonds cause the fatty acid chain to bend, an effect that is compounded with more double bonds in the chain. Three double bonds in 18-carbon linolenic acid, the most abundant fatty-acyl chains of plant thylakoid membranes, render these membranes highly fluid despite environmental low-temperatures, and also makes linolenic acid give dominating sharp peaks in high resolution 13-C NMR spectra of chlorplasts. This in turn plays an important role in the structure and function of cell membranes. Most naturally occurring fatty acids are of the cis configuration, although the trans form does exist in some natural and partially hydrogenated fats and oils. Glycerolipids are composed of mono-, di-, and tri-substituted glycerols, the most well-known being the fatty acid triesters of glycerol, called triglycerides. The word "triacylglycerol" is sometimes used synonymously with "triglyceride". In these compounds, the three hydroxyl groups of glycerol are each esterified, typically by different fatty acids. Because they function as an energy store, these lipids comprise the bulk of storage fat in animal tissues. The hydrolysis of the ester bonds of triglycerides and the release of glycerol and fatty acids from adipose tissue are the initial steps in metabolising fat. Eukaryotic cells are compartmentalized into membrane-bound intracellular components from the extracellular environment. The glycerophospholipids are amphipathic molecules (containing both hydrophobic and hydrophilic regions) that contain a glycerol core linked to two fatty acid-derived "tails" by ester linkages and to one "head" group by a phosphate ester linkage. While glycerophospholipids are the major component of biological membranes, other non-glyceride lipid components such as sphingomyelin and sterols (mainly cholesterol in animal cell membranes) are also found in biological membranes. In plants and algae, the galactosyldiacylglycerols, and sulfoquinovosyldiacylglycerol, which lack a phosphate group, are important components of membranes of chloroplasts and related organelles and are the most abundant lipids in photosynthetic tissues, including those of higher plants, algae and certain bacteria. Bilayers have been found to exhibit high levels of birefringence, which can be used to probe the degree of order (or disruption) within the bilayer using techniques such as dual polarization interferometry and Circular dichroism. The formation of lipids into protocell membranes is a key step in models of abiogenesis, the origin of life. Beta oxidation is the metabolic process by which fatty acids are broken down in the mitochondria and/or in peroxisomes to generate acetyl-CoA. For the most part, fatty acids are oxidized by a mechanism that is similar to, but not identical with, a reversal of the process of fatty acid synthesis. That is, two-carbon fragments are removed sequentially from the carboxyl end of the acid after steps of dehydrogenation, hydration, and oxidation to form a beta-keto acid, which is split by thiolysis. The acetyl-CoA is then ultimately converted into ATP, CO2, and H2O using the citric acid cycle and the electron transport chain. Hence the Krebs Cycle can start at acetyl-CoA when fat is being broken down for energy if there is little or no glucose available. The energy yield of the complete oxidation of the fatty acid palmitate is 106 ATP. Unsaturated and odd-chain fatty acids require additional enzymatic steps for degradation. ^ Maitland, Jr Jones (1998). Organic Chemistry. W W Norton & Co Inc (Np). p. 139. ^ et al.Stryer , p. 328. ^ a b c et al.Stryer , p. 330. ^ a b c Fahy E, Subramaniam S, Murphy R, Nishijima M, Raetz C, Shimizu T, Spener F, Van Meer G, Wakelam M and Dennis E.A (2009). "Update of the LIPID MAPS comprehensive classification system for lipids". Journal of Lipid Research 50 (Supplement): S9–S14. ^ Subramaniam S, Fahy E, Gupta S, Sud M, Byrnes RW, Cotter D, Dinasarapu AR and Maurya MR (2011). "Bioinformatics and Systems Biology of the Lipidome". Chemical Reviews 111 (10): 6452–6490. ^ Mashaghi S., Jadidi T., Koenderink G., Mashaghi A. (2013). "Lipid Nanotechnology". Int. J. Mol. Sci. 2013 (14): 4242–4282. ^ Michelle A, Hopkins J, McLaughlin CW, Johnson S, Warner MQ, LaHart D, Wright JD (1993). Human Biology and Health. Englewood Cliffs, New Jersey, USA: Prentice Hall. ^ Vance JE, Vance DE (2002). Biochemistry of Lipids, Lipoproteins and Membranes. Amsterdam: Elsevier. ^ Brown HA, ed. (2007). Lipodomics and Bioactive Lipids: Mass Spectrometry Based Lipid Analysis, Volume 432 (Methods in Enzymology). Boston: Academic Press. ^ Mandal, Ananya. "Types of Lipids". news-medical.net. ^ Hunt SM, Groff JL, Gropper SAS (1995). Advanced Nutrition and Human Metabolism. Belmont, CA: West Pub. Co. p. 98. ^ Hunter JE (November 2006). "Dietary trans fatty acids: review of recent human studies and food industry responses". Lipids 41 (11): 967–92. 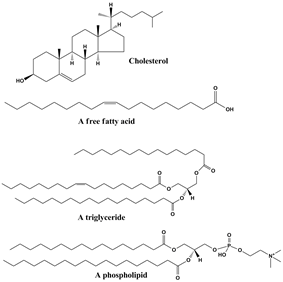 ^ "A Long Lipid, a Long Name: Docosahexaenoic Acid". The Lipid Chronicles. Retrieved 2011-12-31. ^ Fezza F, De Simone C, Amadio D, Maccarrone M (2008). "Fatty acid amide hydrolase: a gate-keeper of the endocannabinoid system". Subcellular Biochemistry. Subcellular Biochemistry 49: 101–32. ^ Coleman RA, Lee DP (2004). "Enzymes of triglyceride synthesis and their regulation". Progress in Lipid Research 43 (2): 134–76. ^ a b Hölzl G, Dörmann P (2007). "Structure and function of glycoglycerolipids in plants and bacteria". Progress in Lipid Research 46 (5): 225–43. ^ Honke K, Zhang Y, Cheng X, Kotani N, Taniguchi N (2004). "Biological roles of sulfoglycolipids and pathophysiology of their deficiency". Glycoconjugates Journal 21 (1–2): 59–62. ^ "The Structure of a Membrane". The Lipid Chronicles. Retrieved 2011-12-31. ^ Berridge MJ, Irvine RF (1989). "Inositol phosphates and cell signalling". Nature Journal 341 (1): 197–205. ^ Farooqui AA, Horrocks LA, Farooqui T (2000). "Glycerophospholipids in brain: their metabolism, incorporation into membranes, functions, and involvement in neurological disorders". Chemistry and Physics of Lipids 106 (1): 1–29. ^ Ivanova PT, Milne SB, Byrne MO, Xiang Y, Brown HA (2007). "Glycerophospholipid identification and quantitation by electrospray ionization mass spectrometry". Methods in Enzymology. Methods in Enzymology 432: 21–57. ^ Paltauf F (1994). "Ether lipids in biomembranes". Chemistry and Physics of Lipids 74 (2): 101–39. ^ Merrill AH, Sandhoff K. (2002). "Sphingolipids: metabolism and cell signaling", Ch. 14 in New Comprehensive Biochemistry: Biochemistry of Lipids, Lipoproteins, and Membranes, Vance, D.E. and Vance, J.E., eds. Elsevier Science, NY, ISBN 0121822125. ^ Hori T, Sugita M (1993). "Sphingolipids in lower animals". Prog. Lipid Res 32 (1): 25–45. ^ Wiegandt H (1992). "Insect glycolipids". Biochimica et Biophysica Acta 1123 (2): 117–26. ^ Guan X, Wenk MR (2008). "Biochemistry of inositol lipids". Frontiers in Bioscience 13 (13): 3239–51. ^ Bach D, Wachtel E (2003). "Phospholipid/cholesterol model membranes: formation of cholesterol crystallites". Biochim Biophys Acta 1610 (2): 187–97. ^ et al.Stryer , p. 749. ^ Bouillon R, Verstuyf A, Mathieu C, Van Cromphaut S, Masuyama R, Dehaes P, Carmeliet G (2006). "Vitamin D resistance". Best Practice & Research. Clinical Endocrinology & Metabolism 20 (4): 627–45. ^ Russell DW (2003). "The enzymes, regulation, and genetics of bile acid synthesis". Annual Review of Biochemistry 72: 137–74. ^ Villinski JC, Hayes JM, Brassell SC, Riggert VL, Dunbar RB (2008). "Sedimentary sterols as biogeochemical indicators in the Southern Ocean". Organic Geochemistry 39 (5): 567–88. ^ Deacon J (2005). Fungal Biology. Cambridge, MA: Blackwell Publishers. p. 342. ^ Kuzuyama T, Seto H (2003). "Diversity of the biosynthesis of the isoprene units". Natural Product Reports 20 (2): 171–83. ^ Rao AV, Rao LG (2007). "Carotenoids and human health". Pharmacological Research : the Official Journal of the Italian Pharmacological Society 55 (3): 207–16. ^ Brunmark A, Cadenas E (1989). "Redox and addition chemistry of quinoid compounds and its biological implications". Free Radical Biology & Medicine 7 (4): 435–77. ^ Swiezewska E, Danikiewicz W (2005). "Polyisoprenoids: structure, biosynthesis and function". Progress in Lipid Research 44 (4): 235–58. ^ a b Raetz CR, Garrett TA, Reynolds CM, Shaw WA, Moore JD, Smith DC Jr, Ribeiro AA, Murphy RC,Ulevitch RJ, Fearns C, Reichart D, Glass CK, Benner C, Subramaniam S, Harkewicz R, Bowers-Gentry RC, Buczynski MW, Cooper JA, Deems RA, Dennis EA (2006). "Kdo2-Lipid A of Escherichia coli, a defined endotoxin that activates macrophages via TLR-4". Journal of Lipid Research 47 (5): 1097–111. ^ Walsh CT (2004). "Polyketide and nonribosomal peptide antibiotics: modularity and versatility". Science 303 (5665): 1805–10. ^ Caffrey P, Aparicio JF, Malpartida F, Zotchev SB (2008). "Biosynthetic engineering of polyene macrolides towards generation of improved antifungal and antiparasitic agents". Current Topics in Medicinal Chemistry 8 (8): 639–53. ^ Minto RE, Blacklock BJ (2008). "Biosynthesis and function of polyacetylenes and allied natural products". Progress in Lipid Research 47 (4): 233–306. ^ et al.Stryer , pp. 333–34. ^ van Meer G, Voelker DR, Feigenson GW (2008). "Membrane lipids: where they are and how they behave". Nature Reviews Molecular Cell Biology 9 (2): 112–24. ^ Feigenson GW (2006). "Phase behavior of lipid mixtures". Nature Chemical Biology 2 (11): 560–63. ^ Wiggins PM (1990). "Role of water in some biological processes". Microbiological Reviews 54 (4): 432–49. ^ Raschke TM, Levitt M (2005). "Nonpolar solutes enhance water structure within hydration shells while reducing interactions between them". Proceedings of the National Academy of Sciences of the United States of America 102 (19): 6777–82. ^ Brasaemle DL (December 2007). "Thematic review series: adipocyte biology. The perilipin family of structural lipid droplet proteins: stabilization of lipid droplets and control of lipolysis". J. Lipid Res 48 (12): 2547–59. ^ et al.Stryer , p. 619. ^ Wang X (2004). "Lipid signaling". Current Opinion in Plant Biology 7 (3): 329–36. ^ Dinasarapu AR,Saunders B,Ozerlat I,Azam K, and Subramaniam S (2011). "Signaling gateway molecule pages—a data model perspective". Bioinformatics 27 (12): 1736–1738. ^ Eyster KM (2007). "The membrane and lipids as integral participants in signal transduction". Advances in Physiology Education 31 (1): 5–16. ^ Hinkovska-Galcheva V, VanWay SM, Shanley TP, Kunkel RG (2008). "The role of sphingosine-1-phosphate and ceramide-1-phosphate in calcium homeostasis". Current Opinion in Investigational Drugs 9 (11): 1192–205. ^ Saddoughi SA, Song P, Ogretmen B (2008). "Roles of bioactive sphingolipids in cancer biology and therapeutics". Subcellular Biochemistry. Subcellular Biochemistry 49: 413–40. ^ Klein C, Malviya AN (2008). "Mechanism of nuclear calcium signaling by inositol 1,4,5-trisphosphate produced in the nucleus, nuclear located protein kinase C and cyclic AMP-dependent protein kinase". Frontiers in Bioscience 13 (13): 1206–26. ^ Boyce JA (2008). "Eicosanoids in asthma, allergic inflammation, and host defense". Current Molecular Medicine 8 (5): 335–49. ^ Bełtowski J (2008). "Liver X receptors (LXR) as therapeutic targets in dyslipidemia". Cardiovascular Therapy 26 (4): 297–316. ^ Indiveri C, Tonazzi A, Palmieri F (October 1991). "Characterization of the unidirectional transport of carnitine catalyzed by the reconstituted carnitine carrier from rat liver mitochondria". Biochim. Biophys. Acta 1069 (1): 110–6. ^ Parodi AJ, Leloir LF (April 1979). "The role of lipid intermediates in the glycosylation of proteins in the eucaryotic cell". Biochim. Biophys. Acta 559 (1): 1–37. ^ Helenius A, Aebi M (2001). "Intracellular functions of N-linked glycans". Science 291 (5512): 2364–69. ^ Nowicki, M. and Frentzen, M. (2005). "Cardiolipin synthase of Arabidopsis thaliana". FEBS Letters 579 (10): 2161–2165. ^ Nowicki, M. (2006). "Characterization of the Cardiolipin Synthase from Arabidopsis thaliana". Ph.D. thesis, RWTH-Aachen University. ^ Gohil VM, Greenberg ML (2009). "Mitochondrial membrane biogenesis: phospholipids and proteins go hand in hand". Journal of Cell Biology 184 (4): 469–72. ^ Hoch FL (1992). "Cardiolipins and biomembrane function". Biochimica et Biophysica Acta 1113 (1): 71–133. ^ Steroids. Elmhurst.edu. Retrieved on 2013-10-10. ^ et al.Stryer , p. 634. ^ Chirala S, Wakil S (2004). "Structure and function of animal fatty acid synthase". Lipids 39 (11): 1045–53. ^ White S, Zheng J, Zhang Y (2005). "The structural biology of type II fatty acid biosynthesis". Annual Review of Biochemistry 74: 791–831. ^ Ohlrogge J, Jaworski J (1997). "Regulation of fatty acid synthesis". Annual Review of Plant Physiology and Plant Molecular Biology 48: 109–136. ^ a b et al.Stryer , p. 643. ^ et al.Stryer , pp. 733–39. ^ a b Kuzuyama T, Seto H (2003). "Diversity of the biosynthesis of the isoprene units". Natural Product Reports 20 (2): 171–83. ^ Grochowski L, Xu H, White R (2006). uses a modified mevalonate pathway for biosynthesis of isopentenyl diphosphate"Methanocaldococcus jannaschii". Journal of Bacteriology 188 (9): 3192–98. ^ Lichtenthaler H (1999). "The 1-Dideoxy-D-xylulose-5-phosphate pathway of isoprenoid biosynthesis in plants". Annual Review of Plant Physiology and Plant Molecular Biology 50: 47–65. ^ a b Schroepfer G (1981). "Sterol biosynthesis". Annual Review of Biochemistry 50: 585–621. ^ Lees N, Skaggs B, Kirsch D, Bard M (1995). "Cloning of the late genes in the ergosterol biosynthetic pathway of Saccharomyces cerevisiae—a review". Lipids 30 (3): 221–26. ^ et al.Stryer , pp. 625–26. ^ Russo GL (2009). "Dietary n-6 and n-3 polyunsaturated fatty acids: from biochemistry to clinical implications in cardiovascular prevention". ^ Riediger ND, Othman RA, Suh M, Moghadasian MH (2009). "A systemic review of the roles of n-3 fatty acids in health and disease". Journal of the American Dietetic Association 109 (4): 668–79. ^ Galli C, Risé P (2009). "Fish consumption, omega 3 fatty acids and cardiovascular disease. The science and the clinical trials". Nutrition and Health (Berkhamsted, Hertfordshire) 20 (1): 11–20. ^ Micha R, Mozaffarian D (2008). "Trans fatty acids: effects on cardiometabolic health and implications for policy". Prostaglandins, Leukotrienes, and Essential Fatty Acids 79 (3–5): 147–52. ^ Dalainas I, Ioannou HP (2008). "The role of trans fatty acids in atherosclerosis, cardiovascular disease and infant development". International Angiology: a Journal of the International Union of Angiology 27 (2): 146–56. ^ Mozaffarian D, Willett WC (2007). "Trans fatty acids and cardiovascular risk: a unique cardiometabolic imprint?". Current Atherosclerosis Reports 9 (6): 486–93. ^ Astrup A, Dyerberg J, Selleck M, Stender S (2008). "Nutrition transition and its relationship to the development of obesity and related chronic diseases". Obesity Review. 9 Suppl 1: 48–52. ^ Astrup A (2005). "The role of dietary fat in obesity". Seminars in Vascular Medicine 5 (1): 40–47. ^ Ma Y. et al; Olendzki, Barbara C.; Hafner, Andrea R.; Chiriboga, David E.; Culver, Annie L.; Andersen, Victoria A.; Merriam, Philip A.; Pagoto, Sherry L. (2006). "Low-carbohydrate and high-fat intake among adult patients with poorly controlled type 2 diabetes mellitus". Nutrition 22 (11–12): 1129–1136. ^ Astrup A (2008). "Dietary management of obesity". JPEN Journal of Parenteral and Enteral Nutrition 32 (5): 575–77. ^ Beresford SA, Johnson KC, Ritenbaugh C, et al. (2006). "Low-fat dietary pattern and risk of colorectal cancer: the Women's Health Initiative Randomized Controlled Dietary Modification Trial". JAMA: the Journal of the American Medical Association 295 (6): 643–54. ^ Howard BV, Van Horn L, Hsia J, et al. (2006). "Low-fat dietary pattern and risk of cardiovascular disease: the Women's Health Initiative Randomized Controlled Dietary Modification Trial". JAMA : the Journal of the American Medical Association 295 (6): 655–66. ^ "Fats and Cholesterol: Out with the Bad, In with the Good — What Should You Eat? – The Nutrition Source — Harvard School of Public Health". Retrieved 2009-05-12. Bhagavan NV (2002). Medical Biochemistry. San Diego: Harcourt/Academic Press. Devlin TM (1997). Textbook of Biochemistry: With Clinical Correlations (4th ed.). Chichester: John Wiley & Sons. Stryer L, Berg JM, Tymoczko JL (2007). Biochemistry (6th ed.). San Francisco: W.H. Freeman. van Holde KE, Mathews CK (1996). Biochemistry (2nd ed.). Menlo Park, Calif: Benjamin/Cummings Pub. Co.